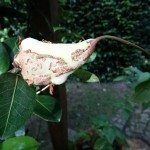 Camellia leaf brown spots: Are they preventable, or is it just sun damage? If the plant is out in the sun and there are no other issues with it, then it's highly plausable that it could be the result of winter burn. The damaged leaves can be trimmed away and the plant should recover fine. If there has been a lot of moisture lately, it could also be attributed to a fungus. Treating with fungicide should alleviate this.